It’s a special thing when kids and parents can enjoy a playdate equally. It requires a special blend of similar discipline styles, an open-minded attitude, scheduling coordination – and that’s just on the parent side. My 7-year-old has known her best friend, Evie, since they were toddlers. Her mom, Kellie, and I quickly became best friends as well, and our playdates were as much for the adults as they were for the kids. 1) Give children access to toys, crayons, etc. 2) Provide healthy snack upon request. Kellie and I would stay within viewing distance but followed a policy of non-intervention. The girls were free to play as they wanted. We jumped in only if tears or shouting broke out. Our explanation to the kids was simple: If you’re not able to get along and work out your problems, we’ll just call it a day. We quickly learned that leaving the girls to their own devices helped them develop their own problem-solving skills. 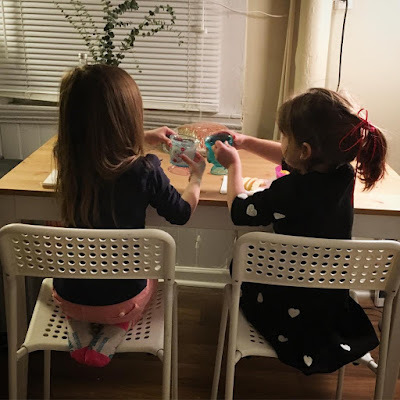 Both girls wanted the playdates to continue, so they figured out their own solutions. Disputes still occurred. But when both girls wanted the same game piece in “Candy Land,” they knew they had to resolve the issue or try another activity. Being comfortable with parallel play is another result of our policy. CeCe may want to play Barbies, but Evie wants to do an art project. So they play side-by-side and don’t try to force the other to join in. Playdates can be a lifeline for parents – opportunities to be social without kids are few and far between for many of us. Playdates also build our children’s social skills, if we let them. To find lasting friendships for the whole family is an added bonus.